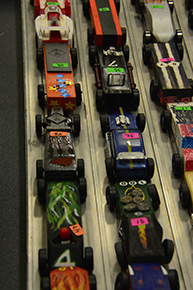 Albion Cub Scout Pack 155 will be holding its annual Pinewood Derby this Saturday, March 3, at the Boone Central School Performing Arts Gym in Albion. The public is welcome to attend. Come see Cub Scout’s car designs and stay for exciting races. This year’s race will include an open class and outlaw races for non-scouts and adults. The event will take place from 10 a.m. until noon, and will include races by scouts from Pack 155 and Pack 175 to determine the derby winner.